java - Passing text captured in a TextField to a Jtable with the help of a button - New and Fresh Private + Public Proxies Lists Everyday! 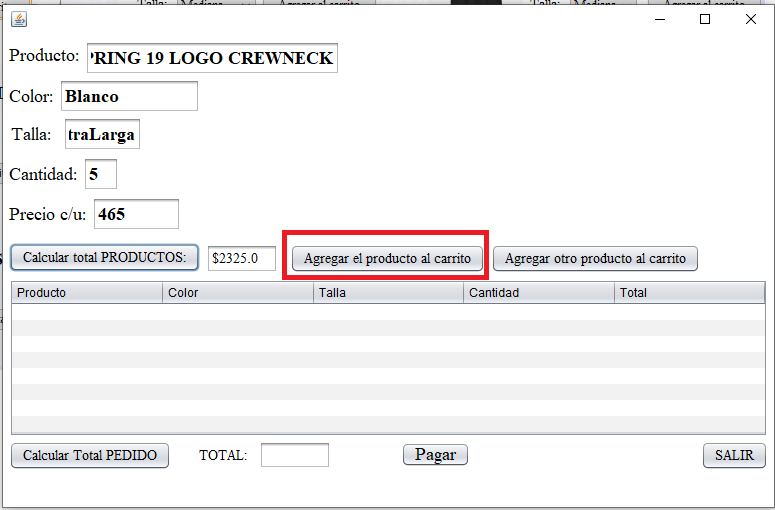 I'm doing a project from my school with only Jframes, I've made a clothing store use 3 Jframes, one with a different menu with men's products and another with the shopping cart, then in the Men's products, the user chooses the clothes that wants and has ComboBox where he chooses the color of the size and quantity and the data that the user chooses to send to some TexField that are in the Jframe cart, what I want is that the button that says "Add product to cart" takes the data that is already in the TextField and sends it to the Jtable sorted as is, do not use any ComboBox Database only and textfield with the .getSelectedItem () statement to pass them to the texfield of the jframe cart. Previous Previous post: 7 – How can I view all images of a field in a view? Next Next post: Customs and Immigration – Visitor Visa for South Africa – How long is it valid?